The following appeared in The Racing Biz February 7th. Advance betting on this year’s Kentucky Derby is available Friday February 8 – Sunday February 10 at the Virginia Bets OTBs in Richmond (Ponies & Pints), Henrico (Breakers Sports Grille), Chesapeake (Buckets Bar & Grill) and in Collinsville/Martinsville (The Windmill OTB Sports Grill). The 362 runners nominated is two more than were nominated early in 2018. The series includes the Kentucky Derby on May 4, the Preakness Stakes May 18, and the Belmont Stakes June 8. The roster of Midlantic-breds includes six from Maryland, six from Virginia, four from Pennsylvania, and one West Virginia-bred. Three of those horses are stakes winners, while two others are stakes-placed. Knicks Go: The Paynter colt was bred in Maryland by Angie Moore and is trained by Ben Colebrook for KRA Stud Farm. He has two wins and over $672,000 in earnings from six career starts. His best efforts include a win in the Grade 1 Breeders’ Futurity and a runner-up effort in the Grade 1 Breeders’ Cup Juvenile. He’ll make his season bow Saturday in the Grade 3 Sam F. Davis Stakes at Tampa Bay Downs, in which he is the 5-2 morning line favorite. Our Braintrust: Another Maryland-bred, this son of Freud began his career in the barn of Laurel-based trainer Cal Lynch, for whom he won the Tremont Stakes at Belmont Park in June and ran second in the Maryland Juvenile Futurity and Jerome Stakes. Sold privately, he is now owned by Gary Barber and trained by Mark Casse. In his first start for his new connections, last Saturday, he was a narrowly-beaten third in the Grade 3 Withers Stakes. Bred by Barak Farm, he has two wins and $196,640 in earnings from five starts. Alwaysmining: Yet a third Maryland-bred, this Stay Thirsty gelding finished his 2018 season with three consecutive victories, taking an allowance race at Laurel Park and then a pair of stakes, the Maryland Juvenile Futurity and Heft Stakes. He was bred by Avia Pitts and is trained by Kelly Rubley for Runnymede Racing LLC, which purchased him privately after his maiden score at Laurel. In all, he has four wins and $191,192 in earnings from nine career races. 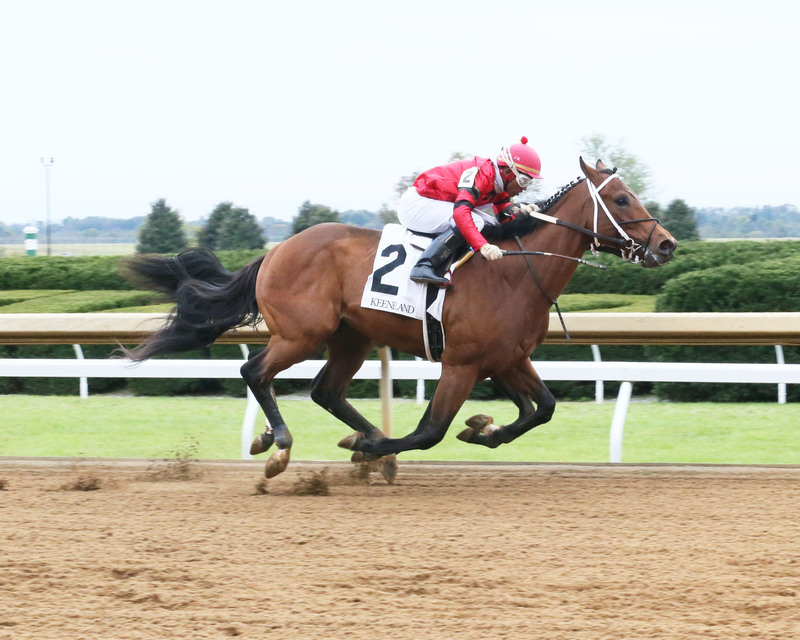 Boldor is shown winning at Keeneland in October last year. Courtesy of Coady Photography. Boldor: This Virginia-bred Munnings colt brought $700,000 from owners Ed and Susie Moore at the OBS two-year-old sale last April, and while he has a ways to go to validate that price, his career is off to a promising start. Never out of the money in three starts, he just missed last out, finishing third, beaten just a half-length, in the $150,000 Smarty Jones Stakes at Oaklawn Park. Trained by Steve Asmussen, he was bred by Carlos S. E. Moore and Gillian Gordon-Moore and has earned over $60,000 in those three races. Jump for Alex: A Pennsylvania-bred Jump Start colt, Jump for Alex will make his next start Saturday in the seven-furlong Jimmy Winkfield Stakes at Aqueduct, in which he is 8-1 on the morning line. A homebred for the Estate of Edward H. Stone, Jump for Alex is trained at Parx Racing by Guadalupe Preciado. He owns two wins from six career starts and is stakes-placed, having run second in December in the Pennsylvania Nursery Stakes at Parx behind the graded winner Call Paul. Jump for Alex has over $117,000 in career earnings. Other nominees include Maryland-breds My Legacy, Shazier, and Trifor Gold; Pennsylvania-breds Machine Learning, Puttheglassdown, and Tizprocess; and West Virginia-bred Final Say. *Passion Play (Mr. & Mrs. C. Oliver Iselin III); Trainer – Dallas Strewart; $31,520 in earnings from pair of seconds and a third in three career starts. Took 2nd in a MSW January 25th at Oaklawn and another November 17th at Churchill. *Speed App (Morgan’s Ford Farm); Trainer – D. Wayne Lukas. $14,327 from six career starts. Best effort was the most recent — a third in MSW at Oaklawn February 1st.